You would think that by being the best team in a sport, you are guaranteed to a championship. However, that doesn’t end up happening most of the time. The 2007 New England Patriots had an undefeated record, but they lost the Super Bowl. The 2017 LA Dodgers had the best record in baseball, but they lost the World Series in 7 games. The 2016 Golden State Warriors broke records because of how many wins they had, but they lost the finals in 7 games. Surprisingly though, the 2018 Boston Red Sox flipped the script on the usual trend. They were the best team in MLB (Major League Baseball) and were able to bring the championship home to Boston. The Boston Red Sox were heavy favorites to win it all once the postseason teams were set, but it wasn’t an easy ride to the World Series. However, the Red Sox sure made it look easy. The Red Sox had to face two 100+ game winning teams: the Yankees and the Astros. The Red Sox took victory over them pretty easily and only lost one game each to the Yankees and Astros. David Price, a starting pitcher for the Red Sox, was hoping to turn around his postseason woes. He was 0-6 with a 6.01 era in the postseason. In the World Series, Price was 2-0 with a low 2.0 era. 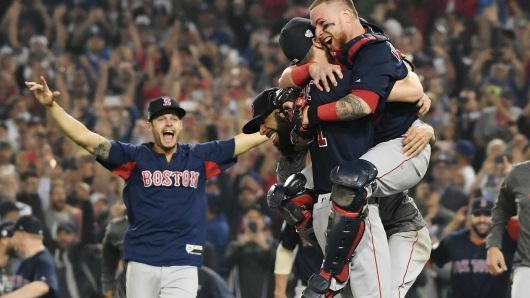 The Boston Red Sox won game one of the World Series against the Los Angeles Dodgers with help from an Eduardo Nunez pinch-hit, a three-run home run that helped the Red Sox win 8-4. The Boston Red Sox also won game 2 at home 4-2 with help from a J.D. Martinez two-run single. Game 3 was the best game of the entire series. Games 3-5 were played at Dodger Stadium and game 3 went a full 18 innings. Game 3 was the longest game in World Series history by both length, 7 hours and 20 minutes, and by innings, 18. Game 4 was a dramatic finish by Boston. Yasiel Puig of the Dodgers hit a three-run home run in the bottom of the 6th to make it 4-0 Dodgers and with the bullpen of the Dodgers as dominant as it was, fans and broadcasters believed the game was over. However, the Red Sox scored 9 runs in the last three innings off of 6 of the Dodgers relief pitchers to win the game 9-6. Game 5 almost no challenge as the Red Sox cruised past the Dodgers 5-1 thanks to late home runs from Mookie Betts, J.D. Martinez, and eventual World Series MVP, Steve Pearce. Boston has won all of their last 4 World Series appearances with their last title coming in 2013 against the St. Louis Cardinals. The Red Sox are the 3rd team in MLB history to win 4 straight World Series appearances. The last team to do it was the Yankees in the ’90’s.